The Blacksmith's Needle on the Quayside, Newcastle. Location: Newcastle Quayside, Newcastle. Materials: Metal Framework with Hand Forged Iron & Steel Objects. The Blacksmith's Needle comprises of six layers, each layer with objects relating to the senses including what was describes as 'the mysterious sixth sense'. 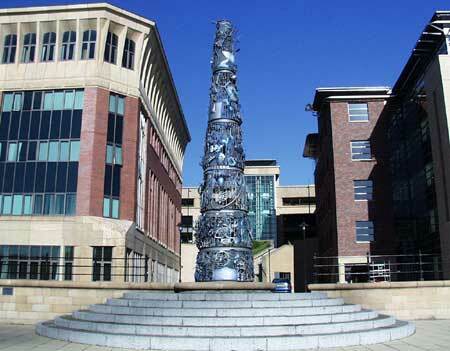 Created from sections made at public 'forge ins' around the country. The Needle was ceremonially inaugerated by the percussionist Evelyn Glennie.